Enter the nameservers for the domain name into the Nameserver entry boxes. Note: You only have to add the host name of the Name Server. 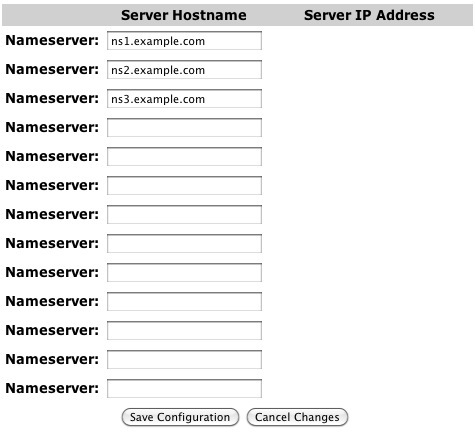 (ie: NS1.EXAMPLE.COM) The IP address of the server is handled automatically. After the changes are made, click Save Configuration. Please note this action does not delete the name server itself — it only removes it from being used by this domain name. To remove a nameserver, you simply erase it from the entry box.